An artist’s impression of the new Woden dining precinct due to be completed in 2019. 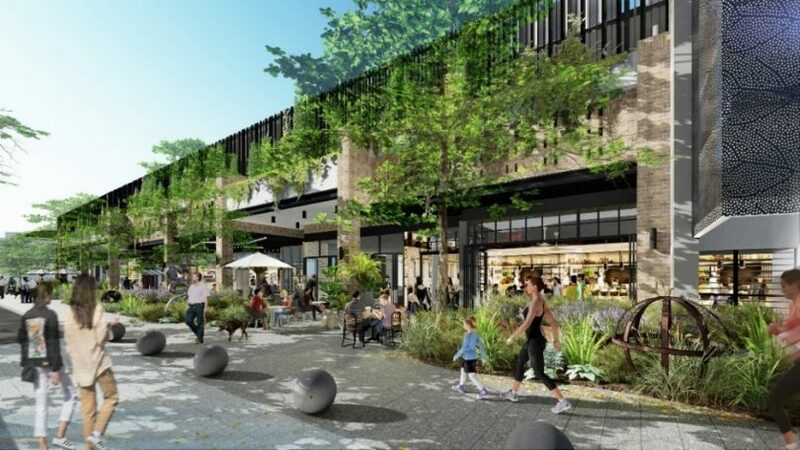 A new dining precinct is expected to breathe new life into the Bradley Street edge of Westfield Woden, with the shopping centre owners announcing a $21 million development that will see six restaurants open in early 2019. The precinct will occupy the ground floor area of the multi-level car park opposite the Hoyts Cinema Complex and demolition has already started to prepare the way for the development. Scentre Group and joint venture partner Perron Group say the new dining precinct will offer residents, professionals and visitors a mix of local and crowd favourite food retailers but are unable to reveal yet what restaurants will be coming to the area. The restaurants will complement the existing offering on Bradley Street, including Grill’d, Rashays and San Churro, and stay open into the evening with late trading hours. ACT Regional Manager Centre Experience, Scentre Group Malcolm Cresswell said the partners believed there was significant demand for an elevated dining experience within the Woden area. “Our vision is to make Westfield Woden a vibrant dining destination; a place to gather, relax and enjoy with family, friends and colleagues during the day and into the evening,” Mr Creswell said. He said existing trees would be retained and more greenery added, with locally commissioned Indigenous and street art to bring colour and vibrancy to the precinct, which will cater to indoor and outdoor dining. 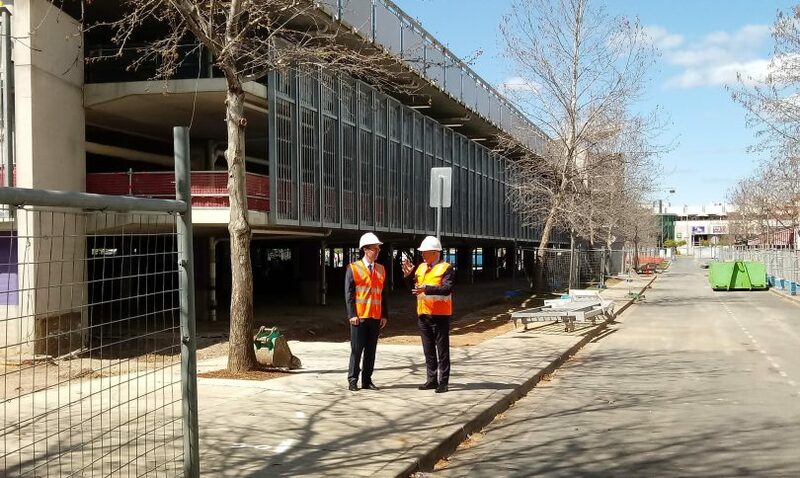 Minister for City Services Chris Steel and ACT Regional Manager Centre Experience, Scentre Group, Malcolm Cresswell discuss the new development in Bradley Street, Woden. Photo: Ian Bushnell. Mr Cresswell said the development was part of an overall upgrading of Westfield Woden including the food court and amenities, which should be completed by the end of the year, and a response to the regeneration of Woden Town Centre. “We believe, and the research shows, that the community will just love this and will actually complement what else is here and also take into consideration the new residential developments that are going into the Town Centre, and hopefully more government employees coming back into the Woden Town Centre over time,” he said. Local MLA and Minister for City Services Chris Steel said the dining precinct marked a step in the regeneration of the Woden Town Centre as a whole, especially with Light Rail Stage 2 terminating 100 metres away in Callum Street, where a new interchange will be built. “The private and public investment in the Town Centre, with more people living in Woden, is contributing to a huge regeneration that we’re starting to see,” he said. Mr Steel said the loss of parking could be managed and he believed there was sufficient overflow parking, especially on weekends, to meet demand.